May all your turkey meat be white! Anyone have fun plans? Just going to the in laws and going to eat way too much and probably drink too much. Am actually off on black friday this year, but doubtful I do anything exciting. Just eating for us, which is why this is my favorite holiday. It's about food. That's it. We're doing the cooking (so we have the leftovers, duh). Small gathering this year as a lot of the regulars are off at in-laws houses. Fine by me! I actually don't like too many people in my house at once. Gives me accident anxiety. Pretty standard stuff at the in-laws with wife and kids. I hope to get more work in on the ALIENS inspired tractor scratch build. Driving a block to my parents and staying as short as possible so that I do not curb stomp any nephews. God I despise them when they are together. Other peoples kids are hell.. thankfully really only my wifes sister has kids, and they're around the same age as mine, so they go off and entertain each other and don't cause too much grief. Hoping I get left alone at some point for some gaming time.. but I'm not optimistic. Kids are the reason I don't like or do big thanksgivings any longer. My family just has way too many of them filthy, germ ridden mongrels. Hunting in the morning, way too much food with the family and an old friend in the evening. He’ll likely arrive with some spirits and firearms, so the next couple days should be fun. Made the trip to my parents. Suspect I drove past 75% of our members to get here. Happy Thanksgiving to all my tiny toy peeps! Enjoy the food, family, and football! 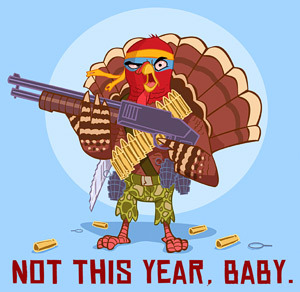 Happy Thanksgiving to you guys also. May God bless you and yours !. Bagged and learned to gut a deer on Thanksgiving Day. My wife spent the better part of Black Friday butchering the meat we cut off. We’re fully country folk now. Did some recreational shooting with my buddy yesterday and enjoyed some Chinese food and recreational beverages last night while watching movies with the family. Then it all caught up with me last night. My voice has gotten rougher each day since about Monday. During the night it blew up into a nasty little cold. I knew all those early mornings out in the cold and lack of full nights of sleep would eventually catch up to me. After a run to the dump this morning the rest of the day today was crash day. Slugged some NyQuil and slept for 4-5 hours. No plans for anything but rest tomorrow either. Sounds like a great weekend, but I feel ya on the sickness. I went down last Saturday and am just now back to normal. Got to enjoy some hot venison stew/pot roast last night for dinner. That was deeeelicious, and felt good on my irritated throat. Fruits of your labor and all that... ‘Course now the wife thinks she’s getting the cold too. Was a busy extended weekend... Thanksgiving was good, watched a little bit of football, good dinner & drinks with family.. Friday was hangover day mostly.. just hung around the house. Saturday we did some shopping and I got a couple hours with RDR2.. went to the Zoo yesterday with the family all day.. meh it's the zoo.. now back to the grind.. Went to the in-laws house for dinner....and it wasn't really all that Thanksgiving themed. I think they served deer steak (not really thick or juicy) rolls, corn,, green beans and.....the only traditional item served...pumpkin pie. Not that I'm complaining, no one asked for my input and no one asked for my help...so I just sit down and appreciate it for what it is, a home cooked meal that I didn't have to make myself. Worked on my ALIENS tractor a tiny bit.